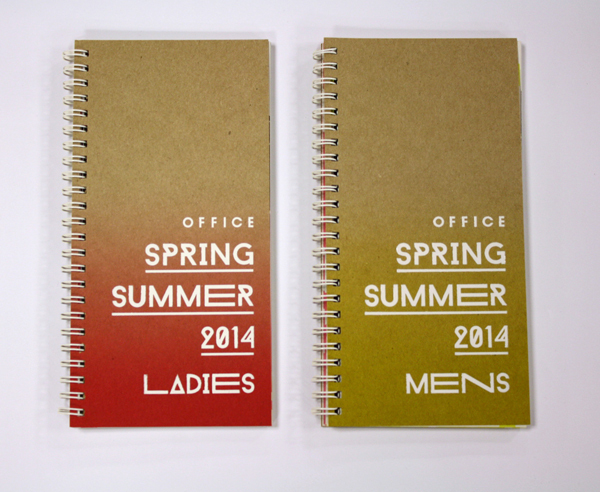 OFFICE SS14 Lookbook & Press Day Elements: Invitation, Gift Card, Press Releases and Envelopes. All elements designed and managed from concept to production and delivery. Lookbook, Product Shots CD, Invitation, Envelopes Press Releases and Gift Card created for the OFFICE Spring/Summer 2013 Press Day. All elements designed and managed from concept to production and delivery. With trends such as Urban Traveller and Game Changer, the product had a clean, bold feel, so I wanted to create a typeface and colour palette to really stand out and highlight the product. The idea was that the typography became almost abstract, to create layers over imagery, becoming almost illegible as it was printed over itself and bleeding off the edges. 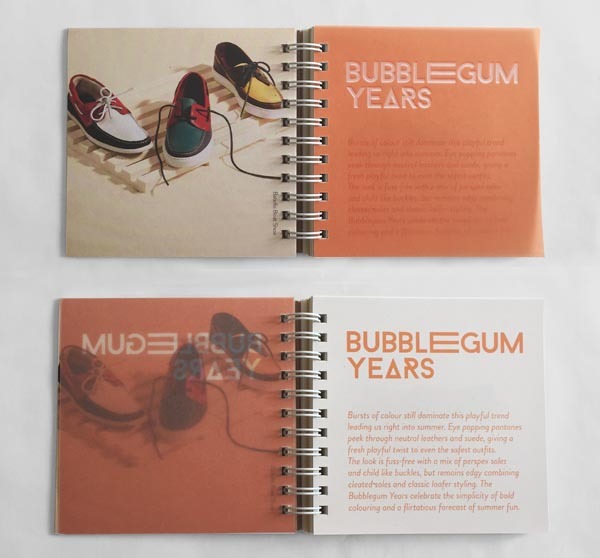 The lookbook was sized at 105mm x 210mm and produced on 175gsm cyclus, with pantone-printed 'onion skin' translucent leaves throughout. The covers were produced on Kraft board, with pantone printed gradients and white foil stamping, with white wiro-binding. The gift card, CD wallet and invitation was also produced on kraft board, and hand screenprinted with pantone ink. The Press releases were digitally printed both sides on 175gsm Cyclus. 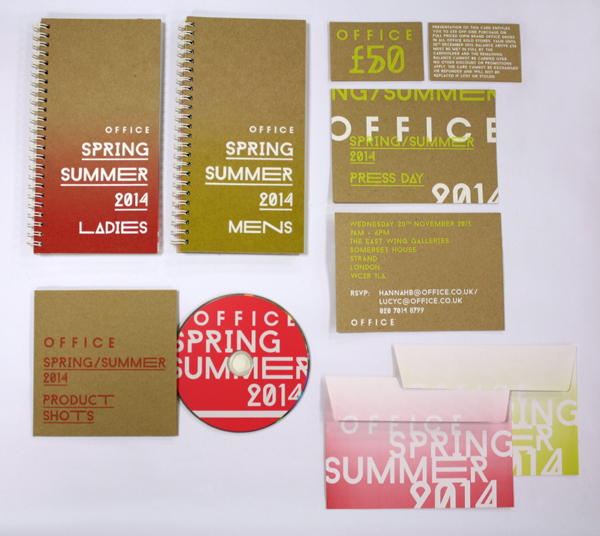 Lookbook, Product Shots CD and Gift Card created for the OFFICE High Summer 14 Press Day. All elements designed and managed from concept to production and delivery. This was a move-on from the previous Spring/Summer 14 Lookbook - I wanted to show that the season feel was still similar and this was a fresh update, rather than a completely new concept. Utilising the same typography and stock papers, with a new, bright spot colour orange. The lookbook was sized at 105mm x 105mm and produced on 175gsm cyclus, with pantone-printed ‘onion skin’ translucent leaves throughout. The covers were produced on Kraft board, with orange and white foil stamping, and white wiro-binding. The gift card and CD wallet was also produced on kraft board, with foiling.